Vietnam and “the environment” seem to go hand in hand. After all, the experience of the Vietnam War is a fundamental chapter in most narratives of the rise of global environmental consciousness. The environmental movement of the 1960s and early 1970s shared many of the same participants with the movement against the Vietnam War. Some of the most egregious widespread damage to the natural environment (and human health) took place during the decade-long American herbicide campaigns of the war. Even the 1972 United Nations Conference on the Human Environment, a precursor to the UN Environment Programme, was widely perceived as a reaction to American activities in Vietnam. In charting the past, our attention often focuses on those years of immense ecological transformation and heightened awareness. An almost entirely separate literature exists on “modernization” schemes of economic development, the failures of which have been subjects of high-profile books such as James C. Scott’s Seeing Like a State. In Vietnam, French colonial administrators and over-confident American nation-builders tried to bulldoze and engineer Vietnam’s way to economic prosperity. Their shortcomings have been traced to many causes, such as inattention to local knowledge, desires, and capabilities. Rarely has the natural world itself featured in a starring role. That is, until now. In Quagmire, David Biggs has written a book that, on the face of it, requires no introduction. 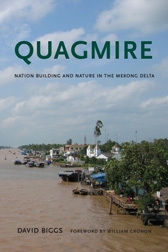 For most Americans, the word “Quagmire” is already associated with the war in Vietnam. Why not take a metaphor and make it literal? It seems to be an ideal vehicle for exploring the actual uses of land and water in Vietnam through its troubled history. However, the book is not specifically about the American war in Vietnam, but rather takes a longer view, trying to understand the role of pre- and post-colonial experts, Vietnamese people, and the landscape itself, in making or breaking economic schemes. To comment on this roundtable, I solicited scholars with a range of historical and anthropological interests, all of whom have written about environmental change in Southeast Asia. Greg Bankoff’s work has focused primarily on the Philippines. His recent research has focused on the idea of natural disasters, and the ways in which human societies denote them as such. In the Philippines, he writes, disasters are simply a fact of life, but we assess their effects through a very narrow lens. By contrasting the impacts of events (such as floods) on humans and on livestock, he has shown how “natural disasters” were constructed almost entirely in relation to effects on human communities, rendering the animals’ roles (and their vulnerabilities) virtually invisible to the historian. David Zierler shares with David Biggs the distinction of having recently written a book that blends environmental history, history of science, and the history of Vietnam. Their approaches differ in that Zierler’s work addresses the influence of the Agent Orange controversy—part of the massive herbicide spraying program conducted by the U.S. Air Force during the American war—on American scientists and the environmental movement. Zierler’s The Invention of Ecocide was the subject of H-Environment Roundtable Reviews 2:1 (2012). John Kleinen is a historian and anthropologist with a keen interest in Vietnam’s history. He began his career by studying anti-colonial peasant movements, and in recent years he has looked more closely at global and regional changes in climate, water levels, and land use. His study of Pierre Gourou, the French colonial geographer who penned a 1936 study of the Red River Delta of northern Vietnam, underlines the persistence of certain geographic ideas, despite enormous political and social changes since the 1940s. Greg Bankoff, “Bodies on the Beach: Domesticates and Disasters in the Spanish Philippines, 1750-1898,” Environment and History 13:3 (2007), 285-306. David Zierler, The Invention of Ecocide: Agent Orange, Vietnam, and the Scientists Who Changed the Way We Think About the Environment (Athens: University of Georgia Press, 2011). Holly High, “Violent Landscape: Global Explosions and Lao Life-Worlds,” Global Environment 1:1 (2005), 58-81. John Kleinen, Facing the Future, Reviving the Past: A Study of Social Change in a Northern Vietnamese Village (Singapore: Institute of Southeast Asian Studies, 1999). John Kleinen, “Tropicality and Topicality: Pierre Gourou and the Genealogy of French Colonial Scholarship on Rural Vietnam,” Singapore Journal of Tropical Geography 26 (2005), 339-58. ← Are Real-Time Strategy Games ‘Environmental’?